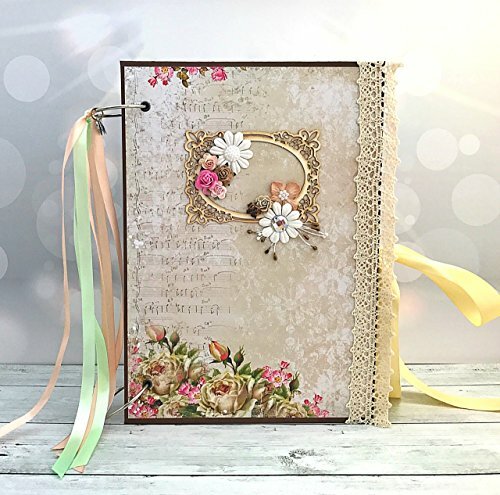 This gorgeous WeddingScrapbook Album makes a really great gift for many occasions such as birthday, anniversary, wedding, prom, etc. It comes in size A4 - 8x11 inches, with 20 beautifully decorated inner pages and it can hold at least 90 of your favorite photo prints. The Anniversary Scrapbook Album has 2 hard cardboard covers with pockets or envelopes on the inside. Interactive elements - numerous pockets, flaps and individual segments. Photo tags and memory tags. The album is embellished with flowers, pearls, die cuts, paper ephemera, lace, ribbon, charms, etc. All you have to do is to place your favorite photo prints inside and to create a beautiful showcase for your precious memories. N O T E: This album is a CUSTOM order and not an in stock item. I'll be happy to create another Anniversary Scrapbook Album just for you. It will be an unique product with a similar design, colors and decorations. There will be some variation due to being handmade. If you have any questions about this product by Kristabella Creations, contact us by completing and submitting the form below. If you are looking for a specif part number, please include it with your message.